GODDARD : PASK - On July 24, 1943, at St.Giles Parish Church, Bramhope, William David GODDARD, Captain, The Dorset Regiment, son of Major and Mrs W. A. Goddard, of Bramhope, to Vivienne Kathleen Alexander PASK, W.R.N.S., only daughter of Mr Vincent Alexander Pask, of Bramhope, near Leeds. [S8] Website Commonwealth War Graves Commission (http://www.cwgc.org) : GODDARD, WILLIAM DAVID Captain 95627 02/08/1944 25 Dorsetshire Regiment United Kingdom XII. B. 6. HOTTOT-LES-BAGUES WAR CEMETERY. "GODDARD- In proud and loving memory of our precious sons, DAVID (Captain, Dorset Regt. ), darling husband of Vivienne née Pask), on this his birthday and wedding anniversary, who fell in France Aug. 2. 1944 : and PETER (Sub-Lieut., R.N., H.M.S. Cornwall), killed on Easter Sunday, 1942." [S3] GRO Indexes to Marriages. "1943/Q3 PASK, Vivienne K. A. GODDARD Wharfedale 9a 313." "GODDARD-Killed in action in Normandy, Aug., 1944. Captain W. David GODDARD. The Dorsetshire Regiment, darling husband of Vivienne (née Pask). 3rd Officer, W.R.N.S., and beloved elder son of Lieut-Colonel and Mrs. W.A. Goddard, Bramhope, Leeds. Also in proud and affectionate remberance of David's younger brother, Peter (R.N. ), killed in H.M.S. Cornwall, East Sunday, 1942." His wife, Blanche, died in 1901 in the Rochford registration district.13 Arthur died on 7 January 1936 in the Kensington registration district at the age of 85. Research Note: The family were not found in the 1891 Census - is it possible that Arthur was in the civil service abroad? Research Note: Searched in 1891 & 1901 census but not found. [S2] GRO Indexes to Births. "1850/Q1 PASK, Arthur Thomas Islington 3 320." [S1087] Website The Times Digital Archive 1785-2008 (http://web1.infotrac.galegroup.com: ) The Times, Wednesday, Jan 15, 1936; pg. 14; Issue 47272; col C.
[S2315] E-mail from John Morton Cross to Stuart & Teresa Pask Birth Certificate states 6 Feb 1850. [S3] GRO Indexes to Marriages. "1877/Q1 PASK, Arthur Thomas Kensington 1a 14." [S3] GRO Indexes to Marriages. "1877/Q1 EYRE Blanche Reeve Kensington 1a 14." [S2325] Image of the 1881 Census for 2 Maygrove Villa, St. John Hampstead, London: RG11 Piece 0169 Folio 54-55 Page 10-11. Enumerated incorrectly under the name of PARKER. [S2326] Image of the 1901 Census for "St. Florence", Victoria Road, Leigh, Essex: RG13 Piece 1678 Folio 63 Page 27. Indexed incorrectly under the name of PARK. [S4] GRO Indexes to Deaths. "1901/Q3 PASK, Blanche Kean Rochford 4a 409 age 39." [S4] GRO Indexes to Deaths. "1936/Q1 PASK, Arthur T. Kensington 1a 124 age 85." [S343] E-mail from Paula Payne to Stuart & Teresa Pask dated 19 August 2007. [S2] GRO Indexes to Births. "1856/Q3 EYRE, Blanch Keene Kensington 1a 120." [S2] GRO Indexes to Births. "GRO Online Index: 1881/Q2 PASK, Isaac Arthur James EYRE Hampstead 1a 648." "For conspicuous gallantry in action. He displayed the greatest coolness during a very heavy bombardment, and carried on after a shell had blown him across a gunpit and slightly wounded him. His dugout has twice been hit, and has constantly gone out through a heavy barrage to observe fire. He put out a fire, although surrounded by ammunition and under heavy fire." [S1344] Website The London Gazette (http://www.gazettes-online.co.uk/) : Page 9420 Supplement to the London Gazette, 26 September 1916. [S4639] Image of the 1901 Census for Dover Castle, Guston, Dover, Kent: RG13 Piece 0840 Folio 97 Page 41. [S3] GRO Indexes to Marriages. "1915/Q4 PASK, Isaac A. J. = HIGGINS, Evelyn B. E. Rochford 4a 2110." [S8] Website Commonwealth War Graves Commission (http://www.cwgc.org) : Name: PASK Initials: I A J Nationality: United Kingdom Rank: Captain Regiment: Royal Field Artillery Unit Text: 28th Bde. Date of Death: 01/09/1916 Awards: DSO Additional information: M.C. Casualty Type: Commonwealth War Dead Grave/Memorial Reference: I. C. 35. Cemetery: DANTZIG ALLEY BRITISH CEMETERY, MAMETZ. [S175] London Gazette "Page 9420 Supplement to the London Gazette, 26 September 1916." [S4999] Website UK Government Probate Search Service: PASK Isaac Arthur James of 9 Richmond-mansions Putney Surrey captain R.G.A. died 1 September 1916 in France on active service. Administration London 29 January to Evelyn Pask widow. Effects £443 6s.6d. [S4] GRO Indexes to Deaths. "PASK, Isaac A. J. Capt. R.F.A. 1916 0.11 233." [S1344] Website The London Gazette (http://www.gazettes-online.co.uk/). [S4999] Website UK Government Probate Search Service: 1917: PASK Isaac Arthur James of 9 Richmond-mansions Putney Surrey captain R.G.A. died 1 September 1916 in France on active service. Administration London 29 January to Evelyn Pask widow. Effects £443 6s.6d. Research Note: No further information found on Evelyn. [S3] GRO Indexes to Marriages. "1915/Q4 PASK, Isaac A. J. HIGGINS Rochford 4a 2110." [S4] GRO Indexes to Deaths. "PASK, Gwen Ellen 5 Nov 1915 Ledbury 1996 June District 5191 Reg 9C Ent 33." [S1044] E-mail from Stephen Pask to Stuart & Teresa Pask dated 25 February 2005. [S3] GRO Indexes to Marriages. "1964/Q1 PASK, Vincent A. = GRIFFITHS, Gwen Surrey Mid East 5c 526." [S4999] Website UK Government Probate Search Service: PASK Vincent Alexander of 4 Cherry Orchard Ashtead Sy died 15 June 1968 Probate London 17 September. £26077. [S4] GRO Indexes to Deaths. "1968/Q2 PASK, Vincent A. 72 Southwark 5E 57." [S4999] Website UK Government Probate Search Service: PASK, GWEN Date of Probate: 09-Aug-1996; Probate No: 9680704484; Date of Death: 27-Jun-1996; Document Type: Grant and will; Registry: Oxford. The engagement is announced between Lieutenant-Commander (A) Alexander Herbert BLACOW, R.N., only son of Mr. and Mrs Alexander BLACOW of Padiham, Lancashire, and Vivienne Kathleen Alexander, widow of Captain W. D. Goddard (Dorsetshire Regiment), and only daughter of Mr. Vincent Alexander Pask, of Banstead, Surrey. [S1044] E-mail from Stephen Pask to Stuart & Teresa Pask dated 23 February 2005. [S4] GRO Indexes to Deaths. "BLACOW, ALEXANDER HERBERT 30 May 1919 SURREY S W 1990 March Volume No 17 Page No 1485 Reg No 390." [S3] GRO Indexes to Marriages. "1947/Q3 BLACOW, Alexander H. GODDARD Portsmouth 6b 1301." [S366] Contact through Website Genes Reunited (http://www.genesreunited.co.uk) : Stephen Pask - 8 July 2007. [S4] GRO Indexes to Deaths. "PASK, MARY ANN 5 August 1898 PRESTON/S R 1991 May Volume No 40 Page No 1989 Reg No 591." [S4] GRO Indexes to Deaths. "PASK, Mary Ann 5 Aug 1898 Preston & South Ribble 1991 May Volume 40 Page 1989." [S3] GRO Indexes to Marriages. "1929/Q1 PASK, Samuel I. LAWRENSON Preston 8e 950." [S1044] E-mail from Stephen Pask to Stuart & Teresa Pask dated 24 February 2008. [S2] GRO Indexes to Births. "1955/Q1 PASK, Samuel I. Preston 10f 378 age 57." [S4999] Website UK Government Probate Search Service: PASK, Mary Ann of Greenfield Nursing Home Tag La Ingol Preston died 14 May 1991 Probate Liverpool 6 September Not exceeding £125000 915170T745A. [S2] GRO Indexes to Births. "1935/Q1 PASK, Irving LAWRENSON Preston 8e 512." [S4] GRO Indexes to Deaths. "PASK, Irving 17 Dec 1934 Blackpool & Fylde 1994 July District 5811D Reg D33C Ent 28." [S5553] Website Scotlands People - Marriages: 1954 PASK, Irving = HALSTEAD, Victoria V F 778/ 41 Selkirk. [S4999] Website UK Government Probate Search Service: PASK, Irving of 9 Calder Avenue Fulwood Preston died 04 July 1994 Administration Liverpool 09 August Not Exceeding £125000 9480805579G. [S2] GRO Indexes to Births. "1935/Q1 PASK, Jean LAWRENSON Preston 8e 512." [S3] GRO Indexes to Marriages. "1954/Q4 PASK, Jean DUTTON Preston 10f 378." [S3] GRO Indexes to Marriages. "1954/Q4 DUTTON William PASK Preston 10f 378." [S4191] E-mail from Vivienne Tate to Stuart & Teresa Pask dated 14 October 2011. 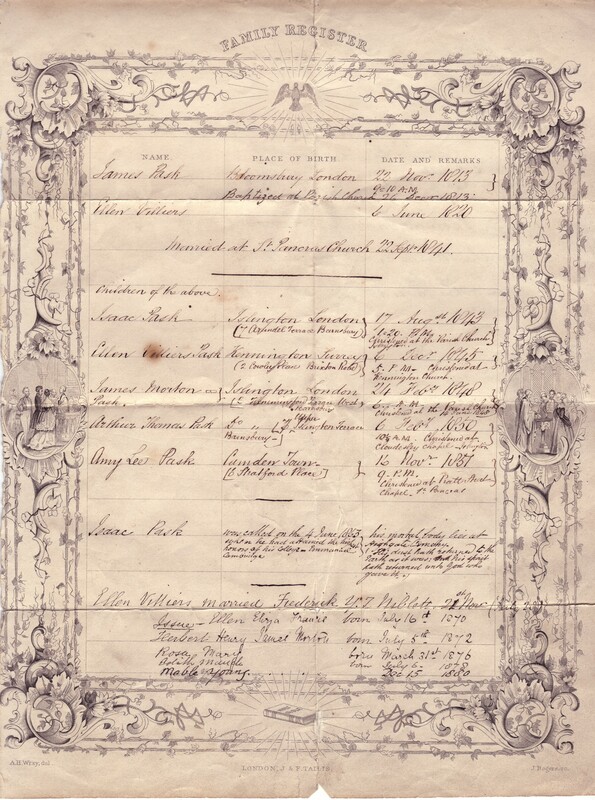 The marriage took place quietly in London on August 26 of Mr. Vincent Alexander PASK, of The Gables, Brighton Road, Banstead, Surrey, and Miss Muriel Jean Sarah SEAR, only child of Mr. and Mrs. A. J. Sear, of Boom Tower, Old Portsmouth. [S4] GRO Indexes to Deaths. "PASK, Muriel Jean S 5 Nov 1917 South East Hampshire 1988 September Volume 20 Page 1632." [S3] GRO Indexes to Marriages. "1953/Q3 PASK, Vincent A. = SEAR, Muriel Westminster 5c 830." [S4999] Website UK Government Probate Search Service: PASK, Muriel Jean Sarah of Tansa 23 Langstone Rd Havant Hants died 7 September 1988 Probate Winchester 7 November £481509 8852423162R. [S3] GRO Indexes to Marriages. "1926/Q3 TOWERS, Frederick PASK Manchester N. 8d 1343." [S3] GRO Indexes to Marriages. "1926/Q3 PASK, Marion H. TOWERS Manchester N. 8d 1343." [S2429] E-mail from Sharon Gill to Stuart & Teresa Pask dated 30 August 2006. [S4] GRO Indexes to Deaths. "1971/Q3 TOWERS, Marion Houghton 13 SE 1894 Heywood 10c 895." [S2] GRO Indexes to Births. "1926/Q4 TOWERS, Jean PASK Bury 8c 759." [S2] GRO Indexes to Births. "1929/Q3 TOWERS, June PASK Oldham 8d 1211." 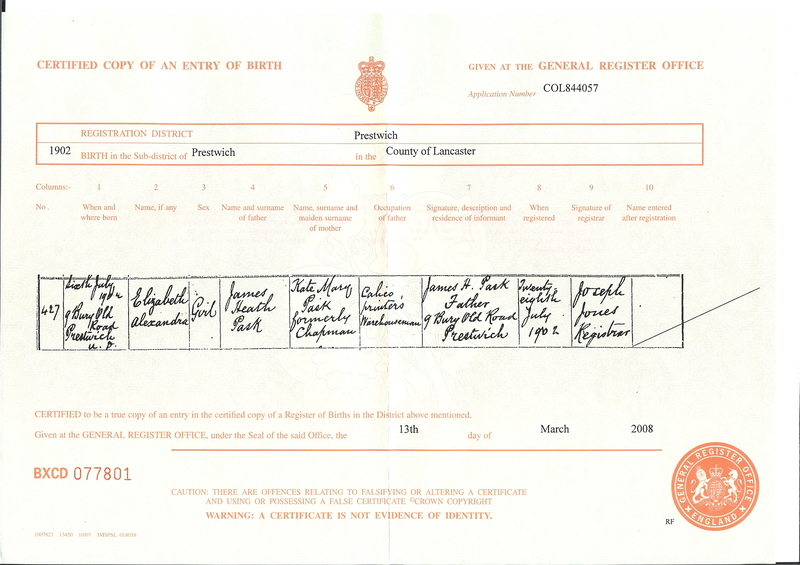 [S3208] Copy of the birth certificate of Elizabeth Alexandra Pask, born 6 July 1902. Kindly provided by Stephen Pask. [S2] GRO Indexes to Births. "1902/Q3 PASK, Elizabeth Alexandra Prestwich 8d 480." [S4945] Image of the 1911 Census for 10 Wellington Road Crumpsall, North Manchester, Lancashire: RG14 Piece 24207 Schedule 411. [S1044] E-mail from Stephen Pask to Stuart & Teresa Pask dated 23 February 2005: "Elizabeth A Pask to Ernest Boardman 1927/Q3 Manchester N. 8d 1245. She must be part of the same family but I don't know where she fits in yet." [S3] GRO Indexes to Marriages. "1927/Q3 Elizabeth A. Pask BOARDMAN Manchester N. 8d 1245." [S3] GRO Indexes to Marriages. "1927/Q3 BOARDMAN, Ernest Manchester N 8d 1245." [S4] GRO Indexes to Deaths. "Elizabeth Alexandra Boardman Birth Date: 6 Jul 1902 Death Registration Month/Year: Oct 1987 Age at death (estimated): 85 Registration district: Manchester Inferred County: Lancashire Volume: 38 Page: 1561." [S27] Website National Burial Index (NBI) @ FindMyPast (www.findmypast.co.uk: ) 20 Mar 1867 Ann PASK 57 Lincolnshire Bardney, St Lawrence. [S4] GRO Indexes to Deaths. "1867/Q1 PASK, Ann Lincoln 7a 335 age 57." [S27] Website National Burial Index (NBI) @ FindMyPast (www.findmypast.co.uk: ) 25 Mar 1834 Edward PASK 54 Lincolnshire Bardney, St Lawrence. [S27] Website National Burial Index (NBI) @ FindMyPast (www.findmypast.co.uk: ) 27 Apr 1836 Elizabeth PASK inf Lincolnshire Bardney, St Lawrence. [S27] Website National Burial Index (NBI) @ FindMyPast (www.findmypast.co.uk: ) 28 Jul 1838 Elizabeth PASK 69 Lincolnshire Bardney, St Lawrence. [S4] GRO Indexes to Deaths. "1838/Q3 PASK, Elizabeth Lincoln 14 257." [S27] Website National Burial Index (NBI) @ FindMyPast (www.findmypast.co.uk: ) 1 Jun 1889 Elizabeth PASK 52 Lincolnshire Bardney, St Lawrence. [S4] GRO Indexes to Deaths. "1889/Q2 PASK, Elizabeth Lincoln 7a 294 age 52." [S27] Website National Burial Index (NBI) @ FindMyPast (www.findmypast.co.uk: ) 1 Dec 1837 Hannah PASK 70 Lincolnshire Bardney, St Lawrence. [S4] GRO Indexes to Deaths. 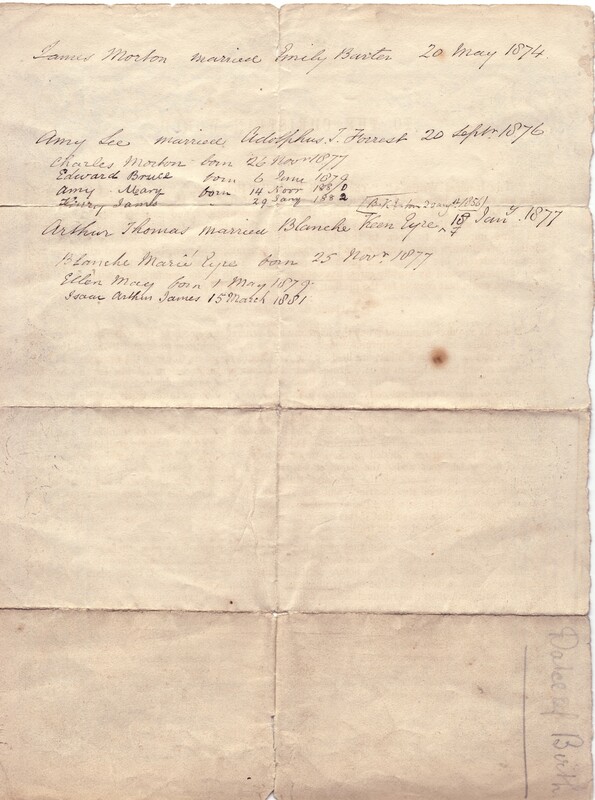 "1837/Q4 PASK, Hannah Lincoln 14 261." [S27] Website National Burial Index (NBI) @ FindMyPast (www.findmypast.co.uk: ) 1 Jan 1850 John PASK 75 Lincolnshire Bardney, St Lawrence. [S1105] Image of the 1841 Census for Bardney, Lincolnshire: HO107 Piece 627 Book 1 Folio 23 from Archive CD Books. [S4] GRO Indexes to Deaths. "1850/Q1 PASK, John Lincoln 14 340." [S27] Website National Burial Index (NBI) @ FindMyPast (www.findmypast.co.uk: ) 22 Oct 1841 Mary PASK 69 Lincolnshire Bardney, St Lawrence. [S4] GRO Indexes to Deaths. "1841/Q4 PASK, Mary Lincoln 14 300."